South Korean girl group, f(x) attended 10 Corso Como 'Seoul Melody' launch party held in Seoul, South Korea on March 28, 2013. Krystal (크리스탈) was my best dressed that evening in a mesh-paneled blouse and matching skirt from Junya Watanabe Spring/Summer 2013 collection. Giuseppe Zanotti 'Wild Africa' sandals to complete her lovely ensemble. I would have loved her outfit more if the top was in black too. Sulli (설리) wore a black pleated coat-dress with a cut-outs and zipper from the same collection. A pair of embellished open-toe pumps to accessorize her look. A pair of edgy boots would suit better. Victoria (빅토리아) opted for a simple asymmetric jersey dress from Junya Watanabe Spring/Summer 2013 collection. A pair of embellished Swarovski sandals from Giuseppe Zanotti to complete her look. Amber (엠버)'s look was the most casual among the group members. She styled her stretch coat with a black blouse, denim and black boots with a statement necklace. Correct me if I am wrong but I don't think Luna (루나)'s outfit was from Junya Watanabe. Overall, I wished they dressed slightly more cohesively as a group on the red carpet. 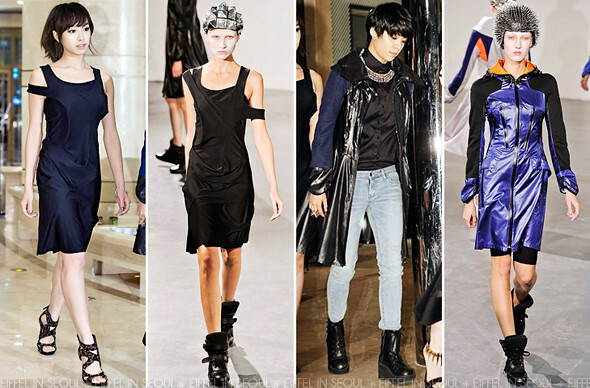 Junya Watanabe Spring/Summer 2013 collection is currently available on Net-A-Porter.